Oil India Limited (OIL) Recruitment 2017: Apply for 394 Nos. Various Posts in Different Trade- Last Date 30-11-2017. - Jobs4NE : Jobs in Assam and North East India. Oil India Limited (OIL) Recruitment 2017: Apply for 394 Nos. Various Posts in Different Trade- Last Date 30-11-2017. 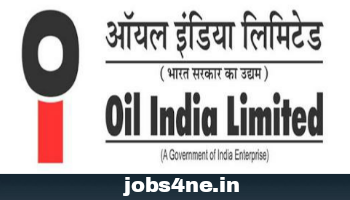 Oil India Limited (OIL) invites applications from eligible candidates from its production and exploration areas in the districts of Dibrugarh, Tinsukia and Charaideo of Assam and Changlang district of Arunachal Pradesh for the recruitment of below mentioned posts. Last Date for receipting of application: 30-11-2017. Total no of posts: 394 Nos. 1. Name of the post: Technician - I (Chemical Lab.) 'Trainee', Grade-VII: 9 Nos. Scale of pay: Rs .16000-34000/-. Educational Qualification: Passed BSc with physics, chemistry and mathematics from Govt. recognised university. 2. Name of post: Assistant Technician - I (Electrical) 'Trainee', Grade-V/ Assistant Technician - I (ICE Electric) 'Trainee', Grade-V: 22 Nos. Scale of pay: Rs. 13500- 28000/. Educational Qualification: Passed class 10 or equivalent. Trade certificate in Electrician trade from Govt. recognised institute. Must possess valid Electrical Workman's Permit (Part/ Class I & Part/ ClassII) issued Govt electrical Licensing Board. 3. Name of post: Assistant Mechanic- I (Pump) / Assistant Technician - I (Cementing)/ Assistant Mechanic- I (Civil)/ Assistant Mechanic- I (Power)/ Assistant Operator -I (Fitting)/ Assistant Mechanic- I (Fitting)/ Assistant Technician - I (LPG)/ Assistant Mechanic- I (Rig Building), 'Trainee', Grade-V: 110 Nos. Scale of pay: Rs. 13500- 28000/-. Educational Qualification: Passed class 10 or equivalent. Trade certificate in Fitter trade from Govt. recognised institute. 4. Name of post: Assistant Technician - I (Equipment)/ Assistant Operator -I (Comb Machine/ Shaping Machine/ Pipe Screw Machine/ Grinding Machine/ Boring Machine), 'Trainee', Grade-V: 7 Nos. Educational Qualification: Passed class 10 or equivalent. Trade certificate in Machinist trade from Govt. recognised institute. 5. Name of post: Assistant Operator -I (ICE)/ Assistant Mechanic- I (ICE)/ Assistant Mechanic- I (ICE/Pump), 'Trainee', Grade-V: 32 Nos. Educational Qualification: Passed class 10 or equivalent. Trade certificate in Machinic Diesel trade from Govt. recognised institute. 6. Name of post: Assistant Technician - I (Field Operation)/ Assistant Operator -I/ Assistant Mechanic- I/ Assistant Technician - I (Compressor Operation/ Compressor Maintenance/ Gas Field Operation)/ Assistant Operator -I/ Assistant Mechanic- I/ Assistant Technician - I (WP/ Operations/ Tank Farm/ WI/ ICE/ P.Oil/ Pump), 'Trainee', Grade-V: 105 Nos. Educational Qualification: Passed class 10 or equivalent. Trade certificate in Machinic Diesel/ Electronics/ Electrician/ Fitter/ Mechanic Electronics/ IT&ESM/ Instrument Mechanic trade from Govt. recognised institute. 7. Name of post: Assistant Operator -I (Boiler), 'Trainee', Grade-V: 11 Nos. Educational Qualification: Passed class 10 or equivalent. Must possess valid and current 2nd class Boiler Attendant Certificate issued by Competent Govt. Authorities. 8. Name of post: Assistant Operator -I (Turner), 'Trainee', Grade-V: 3 Nos. Educational Qualification: Passed class 10 or equivalent. Trade certificate in Turner trade from Govt. recognised institute. 9. Name of post: Assistant Technician -I (Civil), 'Trainee', Grade-V: 14 Nos. Educational Qualification: Passed class 10 or equivalent. Trade certificate in Draughtsman Civil trade from Govt. recognised institute. 10. Name of post: Assistant Technician -I (Instrumentation)/ Assistant Technician -I (Instrumentation/ Inspection), 'Trainee', Grade-V: 15 Nos. Educational Qualification: Passed class 10 or equivalent. Trade certificate in Instrument Mechanic/ IT&ESM trade from Govt. recognised institute. 11. Name of post: Assistant Operator -I (Chemical)/ Assistant Technician -I (Laboratory)/ Assistant Technician -I (Gas Logging), 'Trainee', Grade-V: 33 Nos. Educational Qualification: Passed 10+2 with physics, chemistry and mathematics from Govt. recognised board. 12. Name of post: Assistant Technician -I (Survey), 'Trainee', Grade-V: 5 Nos. Educational Qualification: Passed class 10 or equivalent. Trade certificate in Surveyor trade from Govt. recognised institute. 13. Name of post: Assistant Technician -I (Welding), 'Trainee', Grade-V: 5 Nos. Educational Qualification: Passed class 10 or equivalent. Trade certificate in Welder trade from Govt. recognised institute. 14. Name of post: Assistant Mechanic- I (Auto)/ Assistant Operator- I (Logging), 'Trainee', Grade-V: 23 Nos. Educational Qualification: Passed class 10 or equivalent. Trade certificate in Mechanic Motor Vehicle trade from Govt. recognised institute. Age Limit: For General candidates minimim 18 to 30 years, for SC/ST candidates 18 to 35 years, for OBC candidates 18 to 33 as on 30-11-2017. Selection Process: Written Test and Trade Test. How to apply: Eligible candidates can Apply in prescribed format along with 2 (two) copies of recent 3×3cm coloured photographs and self attested copies of all relevant certificates should be sent to the following address by Speed Post only.